Flipping is back and Pittsburgh is the best place to invest in real estate. A recent report from RealtyTrac shows that nearly 50,000 homes were flipped during the third quarter and such activity made up five percent of all sells during the time period. Among the numerous cities that saw the greatest profits this past quarter was Pittsburgh. Although flipping made up just 2.9 percent of all home sales in the city during the third quarter, nearly eighty percent of buyers paid above market value for their homes. “Many Pennsylvania markets, and particularly Pittsburgh, have the perfect combination of lingering distress and gentrifying neighborhoods,” says RealtyTrac Vice President Daren Blomquist. “The boost in profits this year is in part thanks to dip in interest rates, which gave the first-time home buyers and other buyers that flippers are selling to more buying power to afford higher prices,” he adds. Pittsburgh is certainly undergoing a transformation as more emphasis is placed on historic landmarks and shopping districts. It seems that the city is aiming to put its rich heritage at the forefront while, at the same time, embracing the present. 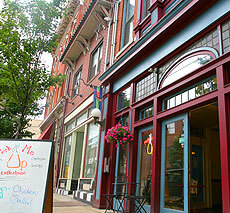 Pittsburgh is a one-stop location for health food gurus, kids, senior citizens and middle aged career persons. The city is definitely the better place to buy a home on the East Coast, and where you will get more for your dollar when investing and flipping real estate.